A collection of medieval era highland romances introduced a few new to me authors, and returned me to discover more from others I already knew. Starting with The Shipwreck from Glynnis Campbell, I’ve now found more reasons to delve into her Maids of Rivenloch series. Tension and action paired with wonderful description and intriguing characters in Brandr and Avril had me speeding through the pages to the end. Following closely (in terms of my favorites in this collection) is MacAllister’s Hope by Lauren Wittig. A reunion long after childhood puts Kieron and Fia face to face, she’s still fey and lovely, and he can’t seem to forget how she touched his heart. A wonderful second chance story that I’ve read before: as Fia comes into her own powers and skills, discovering love and acceptance along the way. Next up for me was another ‘healer’ themed story from new to me author Margaret Mallory. Her story, The Gift, follows the healer Lily, running from persecution and witch hunts in London as she flees north. Near death, this young English woman is rescued by Roderick, who plans to take her home to the clan, hoping her skills will help the clan: he just didn’t plan on needing her so desperately for himself. The last two stories in this collection are from Julianne MacLean and Tanya Anne Crosby. Taken by the Highlander is a story from Julianne MacLean, and starts as a respite from an ongoing clan battle, and the larger war for the independence of Scotland. Mairi and Logan are intriguing, as he is able to find a measure of comfort from his own issues and concerns, and secrets closely held. A slightly darker tone envelops this story, as Logan truly is troubled, and Mairi is both balm and respite. Lastly is Highland Song by Tanya Anne Crosby: a story of a son struggling with the need to be his own man, while bucking convention. Having chosen solitude to battle his demons, he’s determined to never wed, ignoring his own possible future of happiness until Catriona. A young woman not unfamiliar with fighting fate and destiny, she’s perhaps just the one who will bring Gavin back to the life he was meant and destined to have. A wonderful collection full of stories to read straight through, or as quick diversions when the need to escape arrives. 5 exciting Highland novellas from 5 beloved authors. 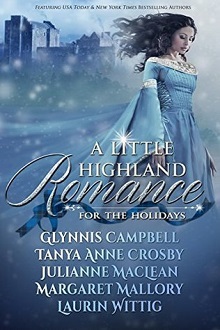 Set against a rich Highland tapestry, bestselling authors Glynnis Campbell, Tanya Anne Crosby, Julianne MacLean, Margaret Mallory and Laurin Wittig invite you to kick up your kilts. With his wife and children dead, Viking marauder Brandr has nothing left to live for, so he sets sail on one last voyage. But when he's shipwrecked on enemy shores, he finds himself at the mercy of Avril, a Scots warrior maid with a half-Viking daughter, who takes him captive. Avril refuses to fall victim to a Northman again...never imagining that soon her fiercest foe will earn her trust, invade her heart, and enthrall her senses. Lily's well-honed sense for trouble tells her no healer is safe in London while gangs roam the city looking for witches to burn. In the dead of night, she escapes on a northbound ship. Roderick MacDonald finds a mysterious sassenach near death on a barren hillside. While he hopes her Gift can save his clan, he's determined to resist the enchantment Lily weaves on his scarred heart. Will these two obstinate souls from different worlds succumb to the magical gift of love? Kieron MacAlister has always loved Fia MacLachlan, a wee fey lass he met years ago who, with her sweet smile and surprising insight, changed his life. When he comes face-to-face with the beautiful woman she's grown into, can he convince her to change her life, too?